TILI stands for Try It, Love It, and the idea is that the box includes luxury samples of some of QVC’s most popular beauty products, giving customers the opportunity to test out new launches from the brands you love, as well as discovering the brands you never knew you needed. 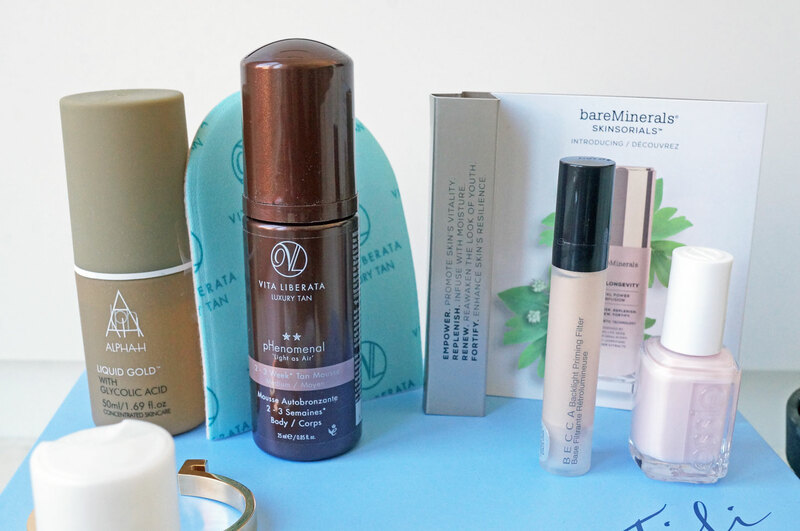 It contains QVC’s beauty buyers favourite picks, across skincare, make-up, tanning and body care, and full size versions of all the products in the box are also available at QVC to purchase. I should point out that there isn’t a subscription service, but there will be a new box available every 3 months. Each box will cost £20.00 and the products will be different each month, with the next box being available in October. Essie Nail Polish in Ballet Slippers, full size worth £8.95. Nexxus Shampoo and Conditioner, 89ml each, worth £5.34 each. Vita Librata Phenomenal Mousse, 25ml, worth £6.25. Alpha H Liquid Gold, 50ml, worth £16.75. Elemis Smart Cleanse Micellar Water, 50ml, worth £6.00. BareMinerals Skincare Skinlongevity Vital Power Infusion, 7.5ml, worth £8.33. Becca Backlight Priming Filter, 6ml, worth £5.62. Total value of box = £62.58. Alpha H Liquid gold: Arealy a cult product, this powerful revitalising lotion is designed to help dull, tired and ageing skin appear brighter, as well as improving the appearance of fine lines and wrinkles. Vita Librata Phenomenal Mousse: This self-tanning mousse is fast-drying and is designed to last for up to two to three weeks – which really is amazing! It also has a tailored-to-you formula allowing you to choose your desired level of colour. BareMinerals Skincare Skinlongevity Vital power Infusion: This first-of-its-kind modern serum essence by bareMinerals unleashes your skin’s vitality, youthful resilience and radiance. With the brand’s patented Long Life Herb Extract at its core, this formula leaves your skin feeling empowered, renewed and fortified. Becca Backlight Priming Filter: This is another must-have cult product, due to the recent popularity of the Becca brand – it’s also been on my wish list for a while so I’m really pleased to find this in the box! The Becca Backlight Priming Filter acts as an instant filter on the skin, creating a diffused, soft-focused radiance that allows your complexion to catch light for a glowing look. It’s also infused with Becca’s blend of crushed pearls, giving the complexion a lit-from-within, healthy-looking glow. Essie Nail Polish in Ballet Slippers: A classic shade that all nail enthusiasts will be aware of – Ballet slippers is a beautiful pale pink polish with a subtle, sheer finish. This beloved award-winning essential is an iconic colour for all seasons. 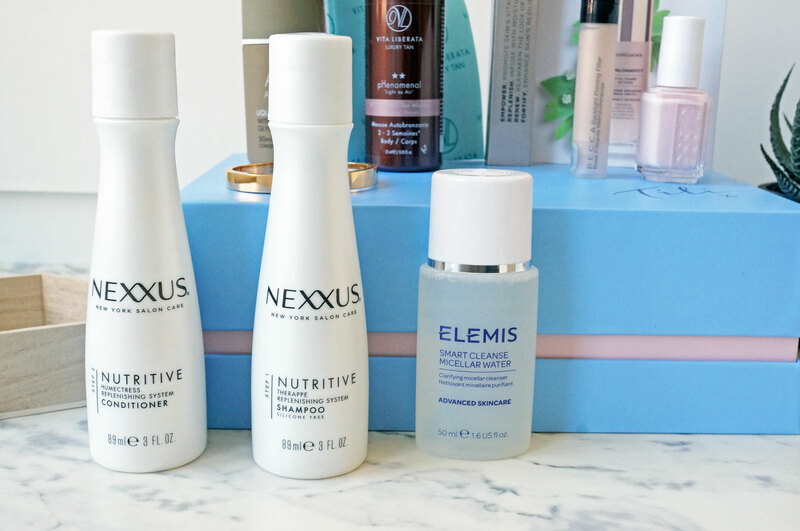 Nexxus Shampoo and Conditioner: This shampoo and conditioner duo is perfect for re-balancing and hydrating dry or damaged hair. They contain 100% pure elastin protein and a precious caviar complex to help restore the hair’s natural protective barrier, leaving hair balanced and flexible. Elemis Smart Cleanse Micellar Water: This refreshing and clarifying micellar water effectively cleanses the skin, removing make-up and the daily build-up of skin pollutants. Cleansing micelles are combined with a complex of natural surfactants to lift impurities from the skin, revealing a clear, radiant complexion. I have to say I’m really impressed with QVC’s first TILI box. I think the price is fantastic considering the brands included as well as the decent sizes of the luxury samples. This is definitely a must have for beauty box fans! The QVC July TILI Beauty Box is available from 22/07/16 at QVC. Next Post Beauty News & Gossip 21/07/16: Kat Von D & Jeffree Star DRAMA, Urban Decay, Pat McGrath & More!